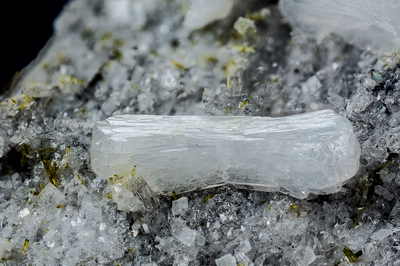 A white crystal of a mineral belonging to the stilbite subgroup, with small white crystals which are also of stilbite and small yellow crystals of an epidote. Collection and photo of Gianfranco Ciccolini. Nikon D750, bellows, Scheider Kreuznach Componon 80 mm; f: 5.6. Focal using 7.